*These locations are not included in the scope of our ISO 9001:2015 registration. 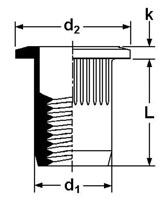 Flat Head Rivet Nuts (with serrations) increase thread engagement in thin metals for improved metal to metal connections. The knurled body expands to 360 degrees to provide exceptional torque and resistance to vibration.